- The club's name is located on the back of the neck under the collar. enough. The club name hiding under the collar is a nice feature. 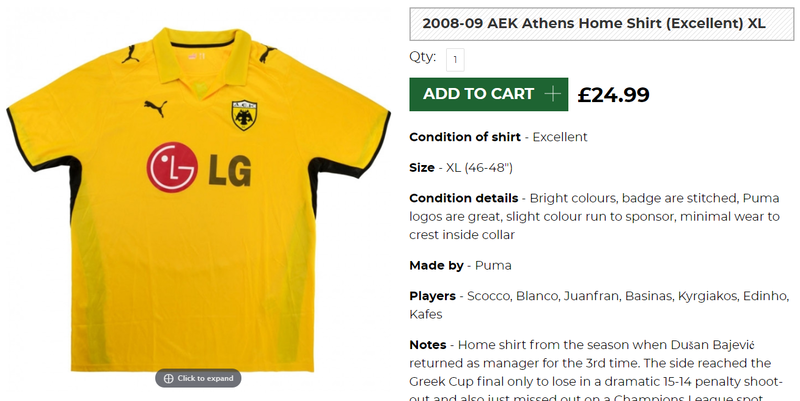 AEK F.C. 's biggest rivalries are with Panathinaikos and Olympiacos. Against neighbours Panathinaikos, they contest the Athens local football derby. The rivalry started not only because of both competing for the major titles, but also because of the refugee ancestry of a big part of AEK fans and, by contrast, that Panathinaikos was considered in general the classic representative of the Athenian high class society. The rivalry with Olympiakos stems from the rivalry between two of the most successful Greek football clubs. The rivalry was particularly inflamed after 1996, when AEK former star player and then-manager Dusan Bajevic moved to Olympiakos, and most recently after the controversial 2007-08 Superleague Greece which was awarded to Olympiacos.